If you perform a quick search for personal finance on iTunes or Google Play, you’ll see hundreds, if not thousands of apps claiming to help you stay on top of your finances. But the descriptions aren’t always comprehensive and it can be difficult to decide which ones would work best for you and your financial needs. We’ve pulled together a comprehensive list of our eight favorite apps with the pros and cons of each one. Not only that, you’ll find them broken down into four helpful categories: budgeting, saving, investing, and credit monitoring. It’s hard to find one app that does it all, so this way you can decide what areas of your finances need the most improvement, and which app can help you achieve your goals based on your individual habits and lifestyle. 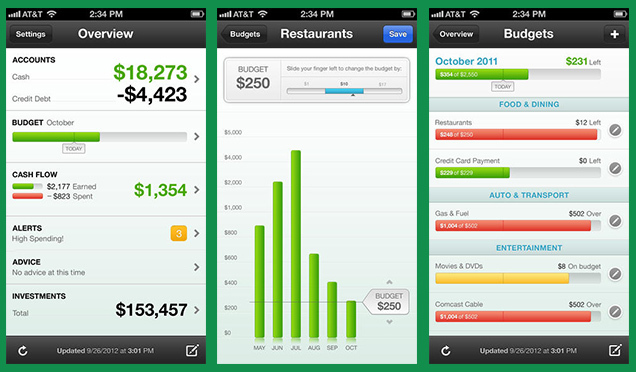 These apps help you stay on top of your spending. Whether you already have a budget and just can’t seem to stick to it, or you’re new to analyzing your expenses each month, our favorite budgeting apps can help even the most spendthrift user get back on track. Sometimes simplicity is best, and Toshl is designed specifically for people who want a quick way to enter expenditures via their smartphone. The basic app is free and allows you to enter two budgets and income sources. You then input and categorize each of your expenses so that you can track your progress throughout the month. An annual fee of $19.95 gives you upgrades such as unlimited expenses and incomes, the ability to export data, and customized graphs of your spending habits. Unlike many other budget apps, Toshl does not link to any of your bank accounts. That means you have to enter everything manually, but you might prefer this way if you want a hands-on approach to your budget or if you are hesitant to share your accounts with a third party. By far one of the most popular apps for budgeting, Mint integrates all of your accounts in one place, including checking, savings, and investments. 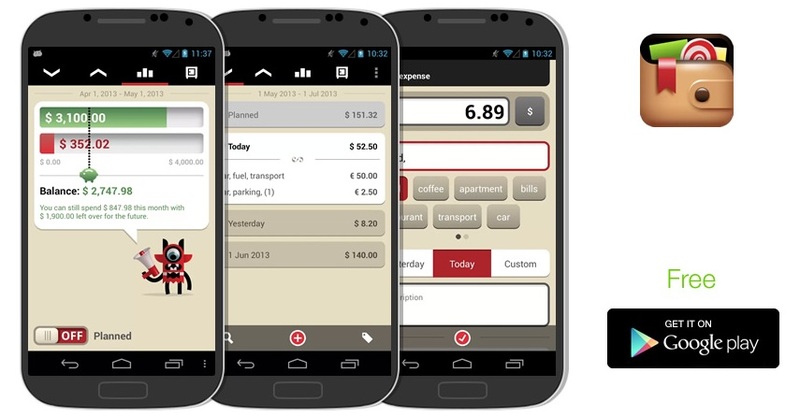 You can track your spending easily with the app’s automatic categorization of your expenses. For example, you can see how much you are spending on fast food and adjust your habits to bring that number down. Other features include alerts when your checking balance is low or credit balance is high and reminders to pay your bills on time. Mint also recently added a free credit score monitoring service, which lets you view your credit score and a summary of your accounts so you know where you have room for improvement. Once you’ve got your budget under control, it’s time to start saving. These apps employ sneaky tactics so you won’t even notice much money missing from your checking account — until you see your savings balance. 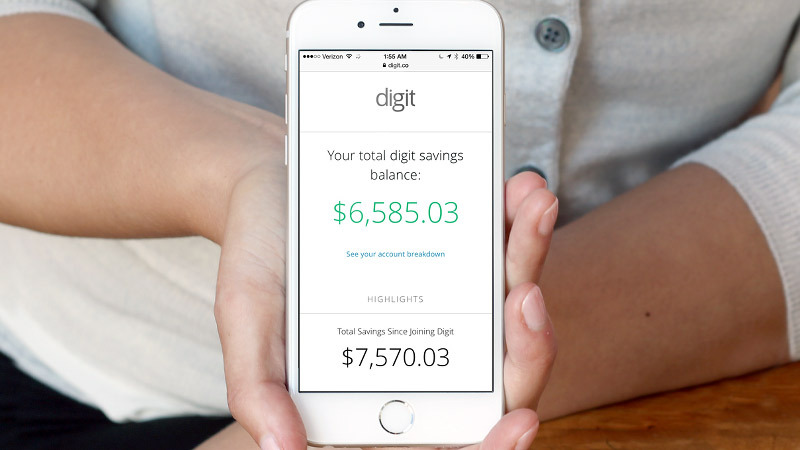 If you want stress-free saving, Digit does the dirty work for you. This free app essentially analyzes your spending habits and transfers money into your savings account when you can afford it. Don’t worry, it has a no-overdraft guarantee and the typical withdrawal amount is anywhere between $5 and $50 every couple of days. Again, the amount depends on your own spending habits. To keep the app free, you don’t earn any interest on your Digit savings account, so it’s best to use this for short-term savings goals. When you’re ready to withdraw your money, you simply text Digit and they will transfer your savings back to your checking account within one business day. There aren’t any balance minimums so it’s easy to get started and you don’t have to worry about any kind of fees. Using the Qapital app takes automated saving to the next level. You start by creating specific savings goals, then set up different spending rules to trigger automatic transfers to your savings account. There are a number of different ways to go about this. One method is to penalize yourself for poor spending habits; for example, you can create a rule to transfer $10 into savings every time you eat at McDonald’s. Alternatively, try incentivizing yourself to spend less at a specific place. Put a cap on how much you want to spend at Whole Foods this month, and if you stay under budget, Qapital automatically sends the remaining budget amount to your savings. You can also create a round-up rule for your debit and credit cards. When you’re ready to withdraw your savings, it takes about two business days to receive your funds. It doesn’t matter if you’ve been investing for years or are just getting started. Picking a reputable investing app gets your money working for you with just a few swipes of your smartphone. If you want to get started in investing but aren’t sure how or don’t have the time, Acorns could be a great app for you. For just $1 a month (or free if you have $5,000 or more in your account), Acorns connects to your credit and debit cards to round up each purchase you make to the next dollar and puts that change into an investment account once it reaches $5. You can also manually move your money into an Acorns investment account. When you sign up for the app, you’ll take a brief survey that identifies your investment goals and appetite for risk. Based on your answers, Acorns then recommends one of five investment portfolios. You can choose whichever one you want, but you are limited to just their five offerings. None of these include an IRA, so this app is not for retirement investing. But if you’re looking for a painless way to automatically start a diverse investment portfolio, Acorns could be right for you. 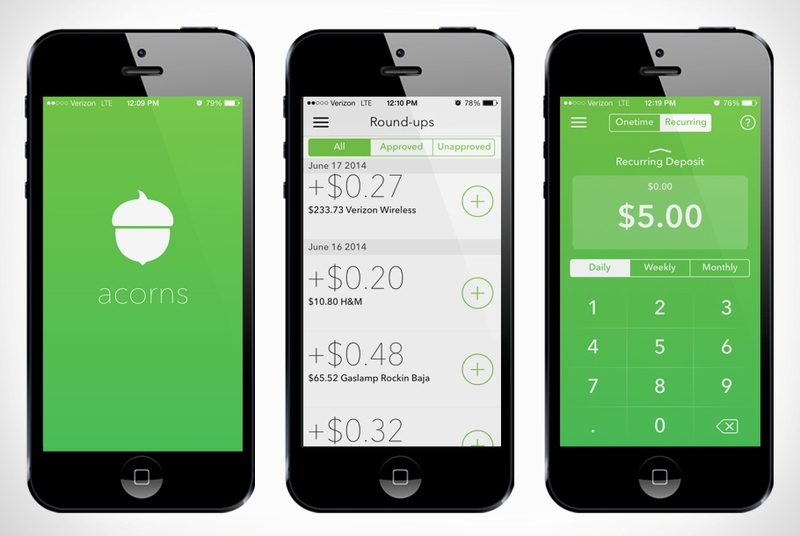 Read our full review of Acorns. 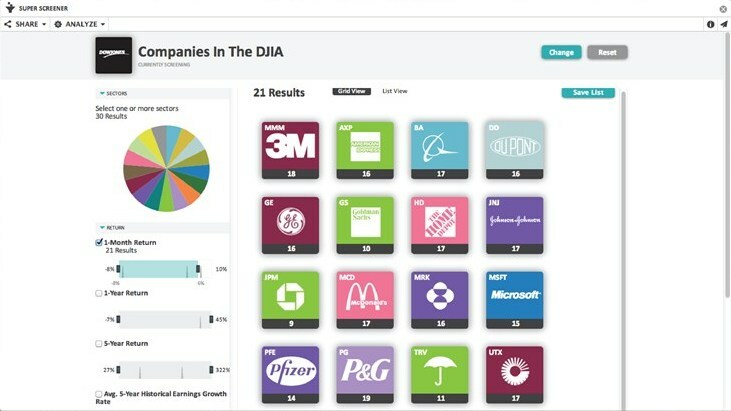 Investment meets video games with this handy app. Not only can you hone your investment skills with a practice portfolio, you can also message other users for tips and advice. There are no account minimums or quarterly maintenance fees, but you do have to pay a flat fee of $7.95 for each trade. Each month, you can compete for cash prizes in the Market Masters Tournament, which is essentially a mock portfolio of $100,000. Trade online or through the mobile app that features easy drag-and-drop trading on the go. Kapitall is great for beginners because it uses company logos instead of ticker symbols as well as minimal technical jargon, so you understand your trades every step of the way. No matter what your financial habits may be, it’s important for everyone to stay on top of their credit history. From witnessing increases in your credit score to detecting early signs of identity theft, these credit monitoring apps give you constant access to this invaluable information. 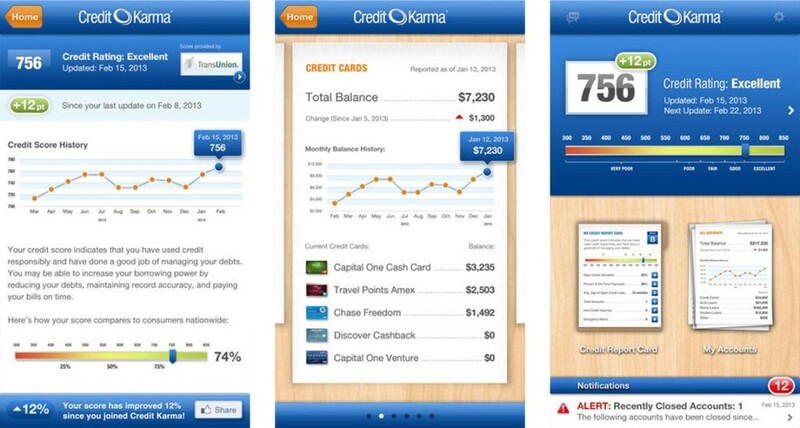 An extension of the popular website, Credit Karma’s app updates your credit information each week, pulling reports from TransUnion and Equifax (only Experian is missing from the three major credit reporting agencies). Not only does the app tell you your credit score, it also rates your credit so you know what potential lenders might think of your overall credit picture. You get instant access to your credit report and the Credit Karma app also sends you alerts when a new account is opened or when a hard inquiry is made. This is a great tactic in avoiding identity theft because you’ll know right away if someone is trying to open up a credit card or get a loan using your personal information. And just like the Credit Karma website, you don’t need to enter a credit card number to access your credit profile or any other features through the app. 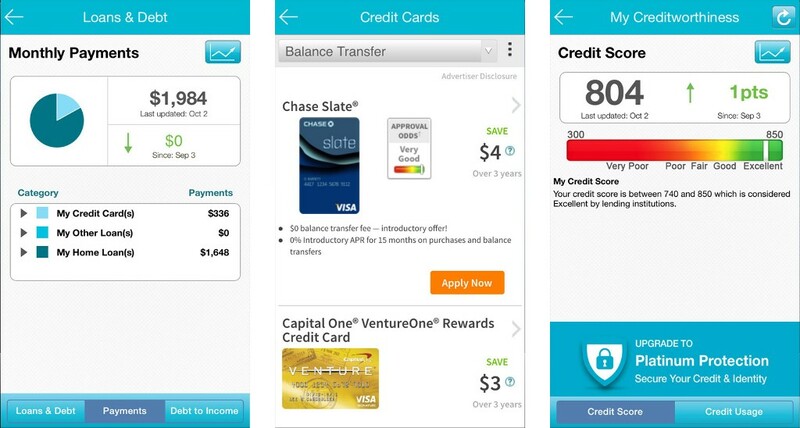 The Credit Sesame app offers both a free version and a more in-depth paid subscription service. With the free app, you receive a monthly credit score update from TransUnion — the other two credit agencies do not participate. Additionally, you’ll get daily monitoring alerts if there are any changes to your credit report. Not only does this feature protect against identity theft, you also get free fraud resolution assistance and a $50,000 identity theft insurance plan. You’ll receive a detailed overview of your finances each month and can track your loan payments, interest rates, and credit ratios. Whether you want them or not, you’ll also get credit offers based on your personal credit profile. There are options for advanced and platinum plans that provide additional services, including daily credit score updates and more in-depth identity protection services. The constant demands of everyday life can make it difficult to stay on top of your finances. By downloading a few strategic apps, you can take control of your money and credit without sacrificing tons of valuable time. After implementing automatic alerts and account transfers, you’ll know exactly where your money is and soon start to reach your financial goals. It’s as simple as the swipe of a smartphone.